My dad, the backseat cook (lol), has insisted that we are eating too much of the same meat. So he decided that he would buy fish, tripe, beef kidneys, and other pieces of meat that I have never eaten…ummmm..I decided to start with the fish. Luckily the COOKBOOK has other fish recipes, and I found escoveitch fish! 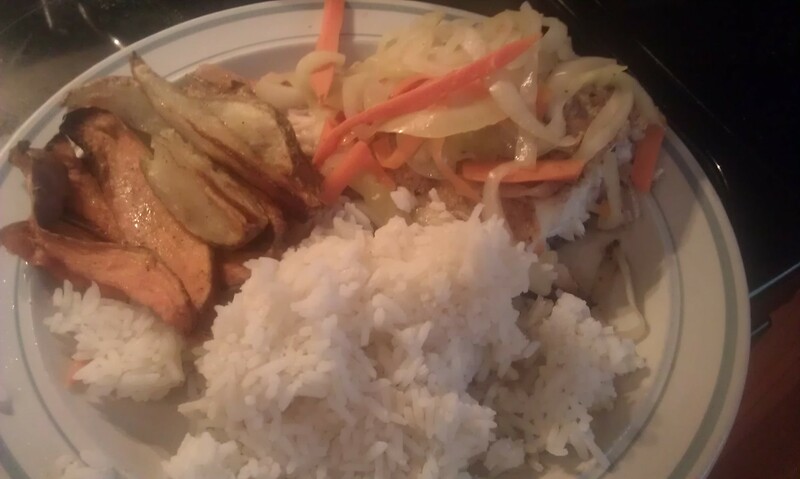 I’ve had this at Jamaican restaurants, and although the fish is delicious it’s the onions and carrots that I always go back for. I’ll worry about the other pieces of meat another time! Clean and wash the fish, rub them with the lime juice, and dry them with a kitchen cloth or paper. Sprinkle them on both sides and inside with salt and pepper. heat plenty of oil in a frying pan until it is very hot and begins to smoke very slightly. Place the fish in the hot oil one at a time, taking care that they do not overlap. Reduce the heat a little and fry the fish on both sides. If they are difficult to turn, then the oil was not hot enough. Leave them for a couple minutes to allow the underside to brown, then turn. When the fish are done, drain them and arrange them on a large platter or in a deep bowl. In the meantime, peel the cho chos and cut them into halves and then into long strips. 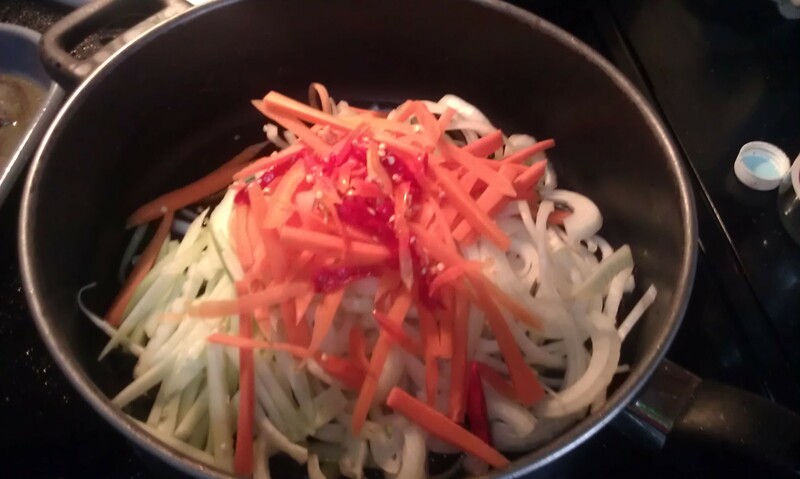 Put them in a saucepan with the onions, hot peppers, pimento, vinegar and a little salt to taste. Bring the mixture to a boil simmer for 2 minutes or so, then remove it from the heat. Pour this hot pickle over the fish. 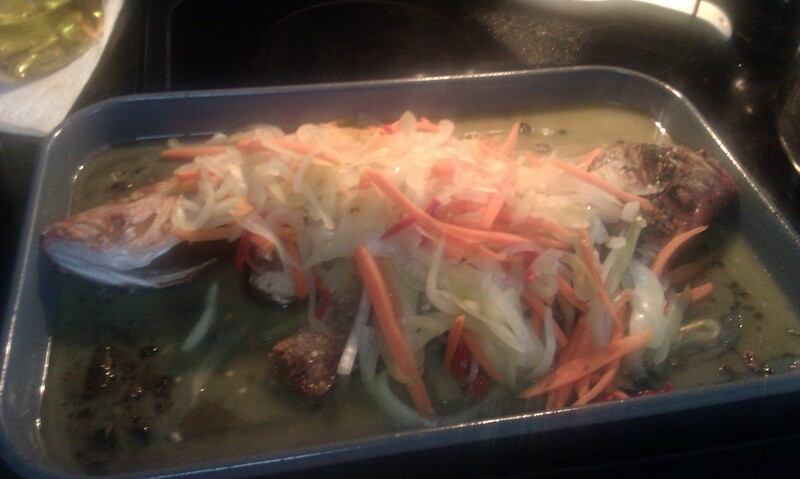 The fish can marinate for 1 hour to 3 days. Can be served hot or cold. O.K Here is what I did! 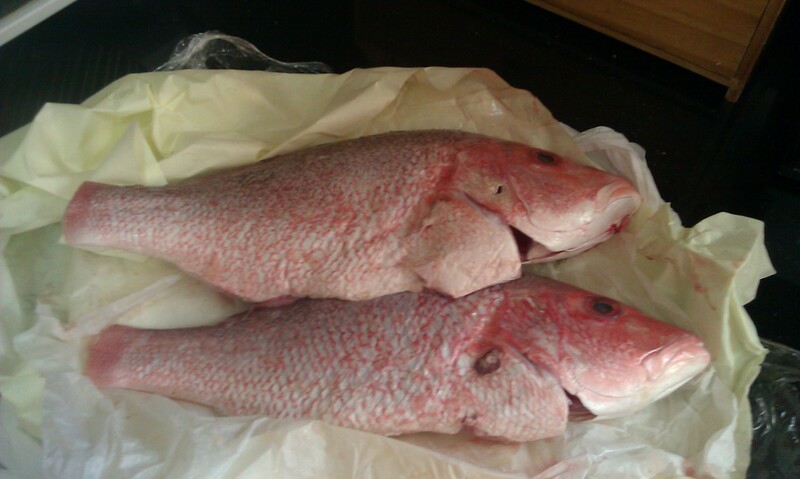 The best fish for this is the red snapper, I got pretty big snapper because I couldn’t find anything smaller. If you can find smaller fish, then please use them, the big ones complicate things! I cleaned and washed those babies, and then salted and peppered the inside and the outside. I couldn’t find a pan to fit them in tho.. LOL. I had to use my bridge burner and a long pan. 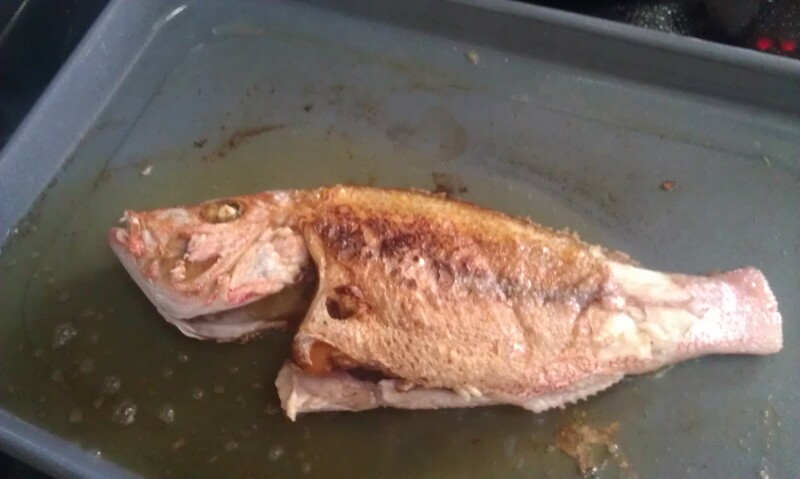 I heated the oil until it was smoking and then carefully placed the fish down…. do this carefully, i splashed the first time. I let them cook for 4-6 minutes and then flipped. 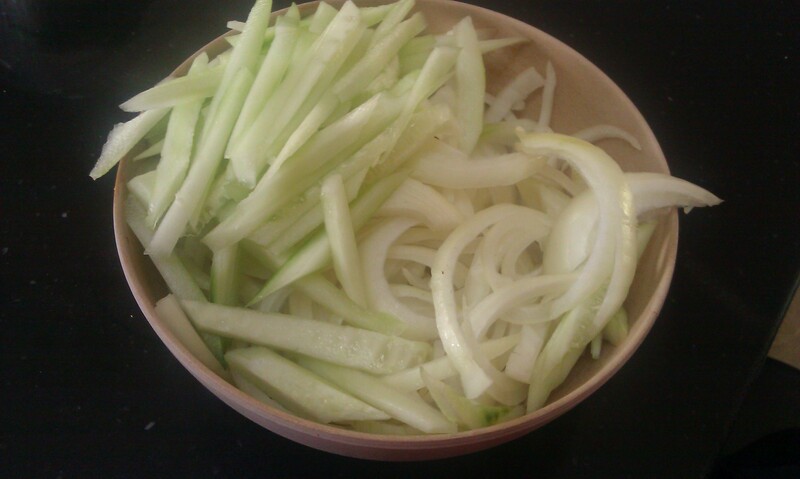 While that was cooking I sliced up my onions, cucumbers (cause I’m still not sure what cho cho’s are, lol), onions and hot peppers. I sliced these into thin strips. I placed my sliced pieces into a pot with vinegar, I used apple cider vinegar. I let it boil and then simmer for a few minutes. 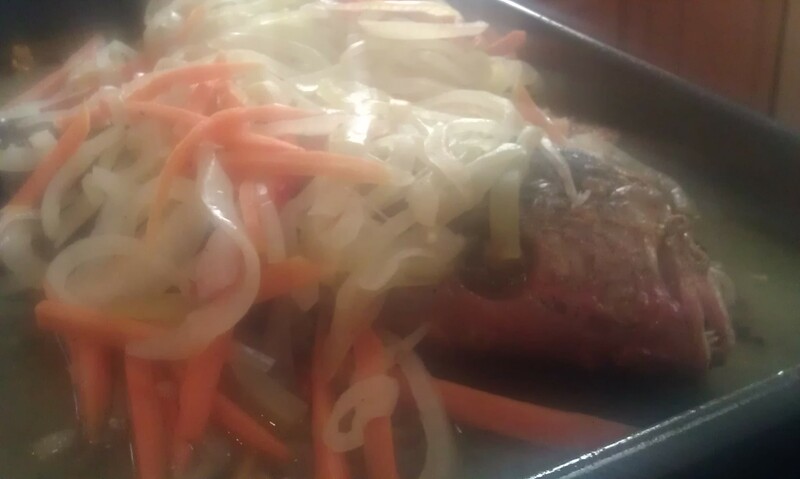 Once the onions and carrots were more translucent, but not soft I wanted them to have some crunch, I poured my mixture over the fish. I let this sit over night. Notice I cut the fish in half, and had two pieces. Don’t be intimidated by the fish head, you can also ask your butcher to cut the heads off and just do the tail end. 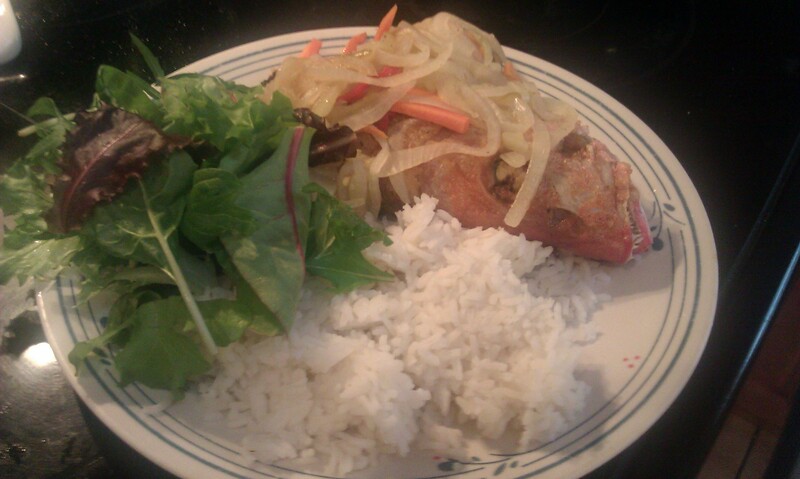 My mother happens to looooove the fish head. This was delicious. The onions and carrots tasted exactly how I wanted them to. Next time I will spice it up another notch!! Thank you! 🙂 I hope you will try a recipe and enjoy!